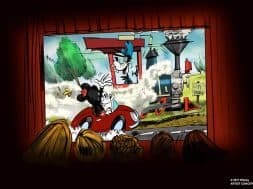 Just because reconstituting half of Disney’s Hollywood Studios into both Toy Story Land and Star Wars: Galaxy’s Edge just isn’t quite enough, Disney has gone ahead today and revealed that it’s adding one final piece to the makeover puzzle: Mickey and Minnie’s Runaway Railway, the first-ever Mickey-themed ride in Disney’s history. 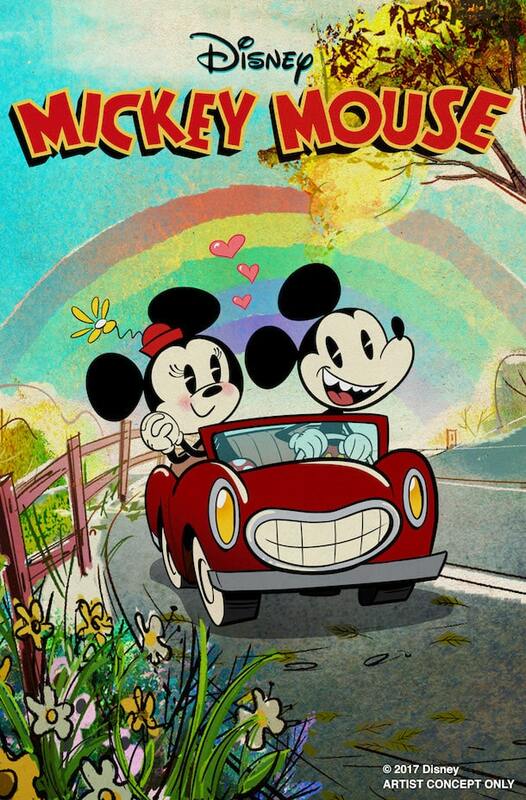 Guests will be able to step into the screen to join Mickey in a brand-new cartoon short; he and Minnie board a train, discover that Goofy is the conductor, and then something happens which will allow you to join them in their zany, anything-goes world. 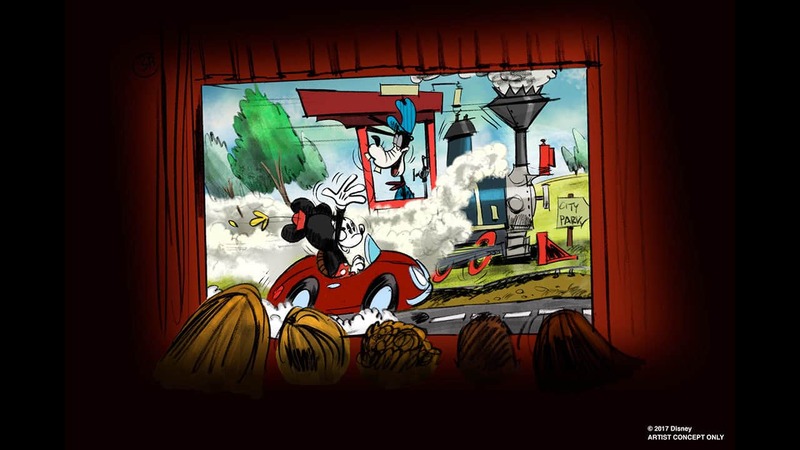 At what can be interpreted as a swipe at Universal with its heavy reliance on 3D, screen-based rides, Disney is boasting that this will be a “2-1/2D” ride, with no 3D glasses required. As Disney itself puts it: “Walt Disney Imagineer Kevin Rafferty said teams are inventing new technologies that turn the flat world of a colorful cartoon short into a ‘dimensional display of amazingness. '” Oh, yeah – it’ll also contain more hidden Mickeys than any other attraction or stretch of real estate at any Disney theme park in the world. While the existence of Mickey and Minnie’s Runaway Railway came as something of a surprise to us (we had previously believed that it would be called The Great Mickey Ride and would function as something of a spoof off of Hollywood Studios’s long-lived Great Movie Ride), its location in the Great Movie Ride’s current location, behind the famed Grauman’s Chinese Theater, was perfectly expected. 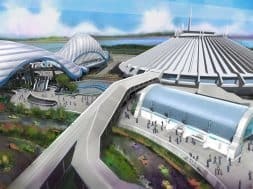 Another delightful surprise was the fact that Hollywood Studios isn’t the only Walt Disney World theme park to be getting a brand-new E-ticket attraction: both Magic Kingdom and Epcot are set to receive Tron Lightcycle Power Run and Guardians of the Galaxy, respectively. 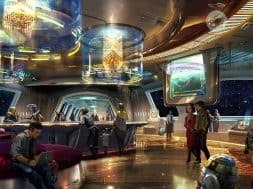 And just in case that isn’t enough in the way of D23 announcements, there was also word today of new transportation options for the resort (gondolas and Uber-like Minnie Vans), an opening date for Toy Story Land, and, the king of them all, the confirmation of a Star Wars-themed hotel. Phew! The Great Movie Ride closes on August 13, 2017.
previous Is this the REAL name of Star Wars Land?